When discussing Winchester’s historic buildings, several times I’ve been asked, “What’s the second oldest building in town?” In the 1960s, the answer would likely have been the small northern portion to the rear of the Conrad House, with an estimated construction date of early 1750s, making it a contemporary of Abrams Delight and George Washington’s Headquarters. As you can imagine, the house had a long and colorful history with the Conrad family, which will only briefly be touched upon here. 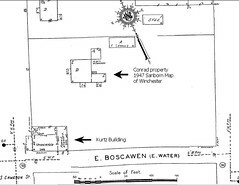 The property, originally consisting of four lots for a total of two and a half acres, has a somewhat complicated deed trail according the local historians Garland Quarles and W. W. Glass. Frederick Conrad, the progenitor of the Conrad line in Winchester, allegedly acquired the property from his father-in-law, Dr. Stephen Ley. The chain of title is, however, unclear, and the possession of the property was disputed several times, but ultimately stayed in the Conrad family’s control. Frederick Conrad’s will from 1794 indicates a building, likely the small northern wing, was existing on the Conrad property at the time of his death, yet his will left instructions for another house to be built on the property. After Dr. Daniel Conrad’s death in 1806, his widow and heirs remained in residence at the mansion for approximately six more years until the upkeep became too onerous. The house was leased to the Farmer’s Bank from 1812-1820, according to William Greenway Russell’s memoirs. By 1836, Daniel’s remaining heirs had consolidated their shares of interest to Robert Y. Conrad. He took up residence in the house with his new bride, and eventually nine children. After Robert’s death in 1875, the house passed to Major Holmes Conrad (1840-1915). Major Conrad had seven children, and in 1928 the heirs decided to sell the property to someone outside of the Conrad family. “The Hill,” as the house was also known, was purchased by H.B. McCormack, Sr. He announced plans in the Star on April 23, 1929 that he would convert the mansion to apartments and also cut down the hill facing Cameron Street and erect modern shop and office space, to be connected to the house through the mansion’s existing basement. The plan obviously progressed no farther than converting the mansion to apartments, though no reason was publicly given for the change. 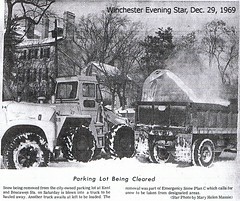 In 1959, the City of Winchester purchased the Conrad House and lot from H.B. McCormack’s heirs and continued operating the building as apartments. As one can imagine, the City had no long-term interest in being a landlord; plans were afoot for the demolition of Winchester’s second oldest building for a parking lot. That saga will be chronicled next Friday – stay tuned!